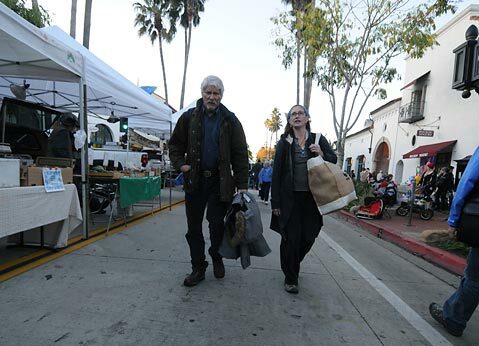 The sun is beginning to disappear for the evening and another long, cold winter’s night is looming in Santa Barbara as social worker Ken Williams and Dr. Lynne Jahnke hop into Jahnke’s Prius, setting out as they do every Tuesday evening to check in with the city’s homeless population. This evening there is a little more urgency than usual. 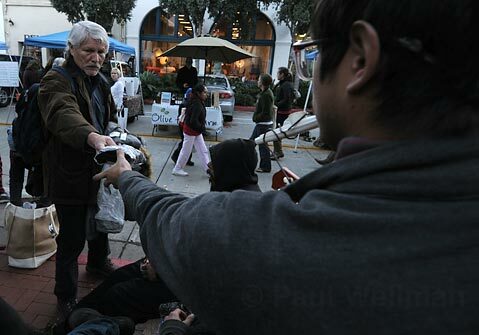 Earlier in the day, Williams received word that another homeless person, a man known as “Freedom,” had died. There was little doubt that the cold played a part in his death. Freedom was a Marine veteran in his 50s, confined to a wheelchair, according to Williams. 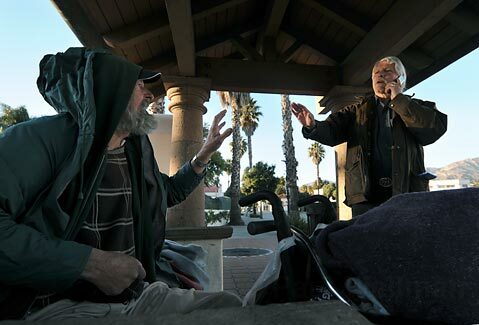 He was the 28th person to die homeless on the streets of Santa Barbara this year. Ken Williams and Dr. Lynne Janhke walk through Tuesday's Farmers Market loaded with sweatshirts, rain ponchos, gloves, and socks. Williams and Jahnke are equipped this evening with bags filled with warm clothes-jackets, coats, socks, gloves, and hats. They start near the Dolphin Fountain at the head of Stearns Wharf, where a man named Joey sits watching the waves lap onto shore. Joey heard earlier that day about Freedom’s death, but sits pretty contently. He takes a poncho and a jacket in preparation for the impending storms. As Williams and Jahnke prepare to move on, Joey speaks of how they got a fellow homeless man into a shelter the previous day, a man named Gibby. Apparently not as equipped as Joey to handle the cold, Gibby “would’ve died out here,” Joey says, if he’d stayed outdoors that night. 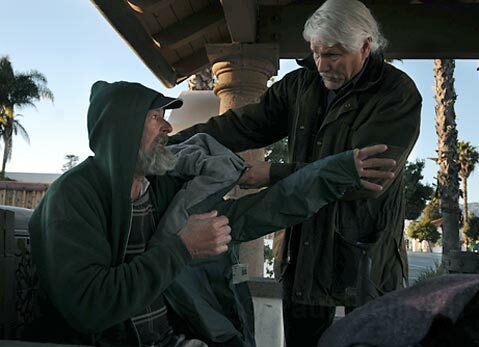 Not far up State Street, at a bus stop at the corner of Mason Street, the two come across two men sitting. 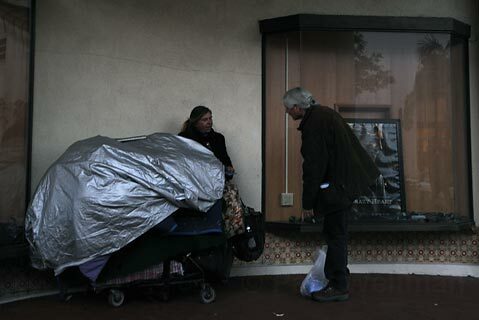 One, Greg, asks Jahnke for some dental advice, while Williams makes a call to Casa Esperanza, hoping to get the other man, Paul, into the shelter. The man is practically blind and his glasses are broken. He appears drunk, and he weeps as he speaks with Williams. He refuses to stay at the Rescue Mission, one of the few places with room. It could be for a variety of reasons: Perhaps he had a bad experience there, or doesn’t like the program. But Williams knows he needs to get Paul somewhere. “Even if this guys sits in a waiting room: he’ll die out here,” Williams says.